Got an old floor lamp that’s surplus to requirements? At least for its intended purpose. Turn it into a plant container. Here, the lamp shade has been removed and a lined basket filled with soil set in its place. It’s a super clever idea, and especially great where height is needed in the garden. 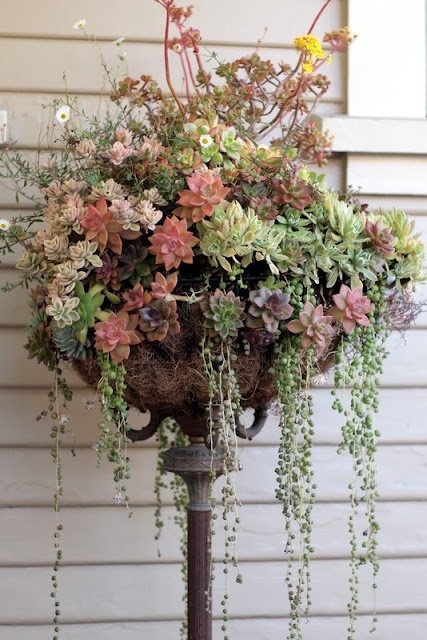 Check out more container ideas for succulents at Mod Vintage Life. wow!! You have just totally changed my mind about succulents! Living in drought stricken California, I am so excited to do several of your projects…. But first is that lamp! I can’t wait to get started…..
Hello Elisabeth. They are all succulents. I don’t know which ones exactly. Some are echeverias, some are sedum. The trailing plant with the little balls is Senecio Rowleyanus. Elisabeth, the Daisy like Flower is called SEASIDE DAISY. It’s a very popular plant in Australia. If you like to contact me I could post you some seeds. Their site has different varieties and some of them are for colder areas. So you could pick the one you like. Jane I also love your ideas. I already have a a basket set up but was going to hang it. Now I will try to find a lamp post. Thanks Sandi! And thanks for your comments above. Good luck with your project!